The allure of the investment industry has long attracted numerous successful UCLA alumni. For Gary Ghazarian, it was no exception. With over 25 years’ experience in the field, he currently serves as the Director of Operations for Marketable Securities at leading alternative investment firm Kayne Anderson Capital Advisors. 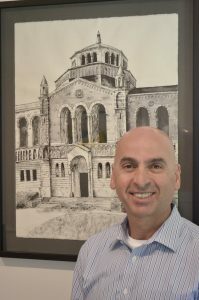 Having pursued a degree in Economics at UCLA, he fondly recalls his memories here; sitting at the front row of almost every basketball game, scoring the first goal in IM soccer for the Armenian Student Association, and most of all, meeting his wife while working part-time on campus in his senior year. Gary’s foray into the field of investment management began when he found a stockbroker internship from the job postings listed at the campus career center. Ironically, the day he called inquiring about the internship was Black Monday in 1987 when the market was down over 20%. It is his firm belief that with disruption comes opportunity and that we should use these opportunities to add value where we can. Recalling the limited number of job openings in competitive firms, he stresses the importance of networking. Networking allowed him to hone his interpersonal skills, and, combined with his specialized skill set, has enabled him to win the trust of clients while opening new doors. His advice to young Bruins is to reach out to UCLA alumni, including himself and his colleagues, who are more than happy to let students do informational interviews and ask questions they may have about the field. After furthering his education with an MBA degree in corporate finance, Gary went on to work at the investment consulting firm Wilshire Associates. After several years at Wilshire an opportunity arose at a client firm – Kayne Anderson Rudnick, which is a traditional and conservative equity management firm. After a few years there, he went on to work for Kayne Anderson Capital Advisors, which was formerly affiliated with Kayne Anderson Rudnick. He described the move by saying, “They told me they were growing rapidly and that they needed help on how to go about it. So they basically asked me to come over, figure out what needed to be done, and do it”. He states that the variety of issues that arise is what makes his day interesting and fascinating. Moreover, he shares that in fast moving markets it is crucial to be able to multitask and prioritize – a skill that comes with years spent on the time-pressured UCLA quarter system. Above all, Gary shows the spirit of a True Bruin as he proudly speaks of his role in supporting UCLA Operation Mend – which provides intensive reconstructive surgery and physiological and psychological medical treatment to post-9/11 veterans free of charge – both financially and personally as a volunteer in their “Buddy Program”. He and Kayne Anderson’s charitable foundation were recognized in Congress by Representative Julia Brownley for their support of veterans.